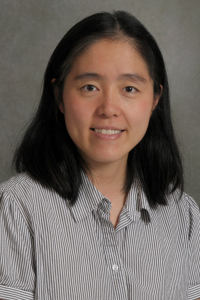 Designing novel biomaterials for tissue engineering is the focus of Dr. Meng’s research. She is investigating the self-assembly of bone extracellular matrix (ECM) proteins, and is developing new models for understanding biomineralization at the cell-substrate interface. Recently, Dr. Meng has shown that the correct formation of the bone ECM network by osteoblasts during the early stages can be tuned by substrate materials properties and is critical for hydroxyapatite nucleation and maturation during the late differentiation stages. Currently, she is using a bottom-up, biomimetic approach toward bone tissue engineering, using an array of in-situ, high-resolution techniques including scanning probe microscopy, x-ray diffraction, Fourier-transform infrared microspectroscopy, and scanning transmission x-ray microscopy. Investigate the role of material surfaces in driving cell-extracellular matrix interactions. Understand the mechanisms of physiological mineralization.